Advance the Practice. The purpose of the Product Management Community is to advance the knowledge, quality, and opportunities for Product Managers living in the Pacific Northwest. Preferred by Employers. Our vision is of time when the members of the Product Management Community are specifically recruited for the most coveted positions in their field because they are part of the Community. Prospective employers recognize PMC membership indicates a Product Manager’s commitment to continuous self-improvement and dedication to becoming and maintaining top performance. Inspired to Excel. Our mission is to be a community of Product Managers who inspire, motivate, and mentor each other in the advancement of our knowledge, practice, and careers. The PMC is currently seeking Board members for 2019! 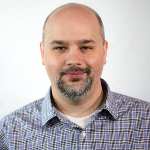 Cliff Gilley has been a B2B product manager for nearly 15 years in a variety of industries, and is a passionate advocate for agile, effective Product Management. He currently works for Garter as a Research Analyst providing support to Product Managers in large organizations. In his spare time, he's a fan of horror movies and novels, comic books, video games, and enjoying hiking, biking and camping when the Northwest weather permits. Cliff joined the PMC board in January 2017. Jennifer is a senior product manager at Valant Medical Solutions with a demonstrated history of product management in the health care industry. She is skilled in health information exchange, clinical user workflow and software implementation. Jennifer earned a BA in Biology from Texas A&M University and enjoys hiking on the weekends. Dan is a Director of Product Management at zulily.com. He has +20-years of experience building Supply Chain software systems at multiple top 500 e-commerce companies. Dan is a passionate mentor of Product Management inside and outside of the PMCNW.org. He enjoys bringing people together to build a stronger Product Community in the greater Puget Sound region. Dan joined the board in January 2017. Diana Hsu is a product manager at Groupon leading affiliate marketing product initiatives. Previously she spent six years building and launching free to play games, and can talk for hours about virtual goods and RPG character development. In her free time, she enjoys hiking and growing her art collection of faux taxidermy heads. Arthur is a product manager with 10+ years of experience building data modeling products across industries. His focus is on enabling sound decision making in complex systems. He moved from research in the aeronautics sector to product management in the energy and the MarTech industries. Born and raised in France, Arthur has been living in Seattle since 2017. He loves spending time in the mountains but needs to find more time to go rock climbing. Melissa is an experienced Digital Marketing professional with a wide range of past roles that touch on social media, email marketing, UI testing, SQL reporting; but always focusing on Paid Search. She started by winning a year membership at Product Camp Seattle 2014. Since then, Melissa has enjoyed each month learning more about Product Marketing and Product Management from the brilliant speakers. In her free time you can find her cheering on the Seahawks or off driving to a camping spot someone recently mentioned. Danielle is a product and business technology manager with extensive experience building and streamlining products within highly competitive financial markets. Her efforts most recently have been directed toward local agriculture and secondary products as her spare time and energy are enthusiastically spent on the family farm located on the Kitsap Peninsula. Danielle joined the PMC in January 2018. Paula Kosasih is currently a Product Manager for Lowe's e-commerce. Her specialty includes Search and Recommendation engines. She is passionate about sharing her knowledge and experience to Product Managers community in Seattle. She is a double Husky - both for her Bachelor of Science and Master in Business Administration. In her free time, she loves to travel the world. Sourin is passionate about all things people and technologies. In building PMC, he wants to contribute back to our community, its growth and make a few good friends. If you still believe in our primitive H2H communications, or have some ideas or concerns with our community, feel free to reach out to him. Sourin has invested 18 years in software engineering, product ownership, GTM in Fortune 100s and building start-ups. His current vocation is to create new product & solutions to secure corporations in the digital space. Denise is an experienced Voice of the Customer professional with a wide range of past roles in project management, tech, operations, marketing, sales and customer engagement. She works closely with the Quality Engineer Team in her current role to ensure all solutions are customer-centric. Denise was introduced to PMC through volunteering at Product Camp and attends many PMC events to learn about current trends in Product Management and gain new skills. In her free time, Denise volunteers for a variety of organizations in the tech world as well as refugee outreach and various mentoring programs. 280 Group is the world’s leading Product Management training and consulting firm. We help companies and individuals do GREAT Product Management and Product Marketing using our Optimal Product Process™. We have been delighting customers around the globe for over 20 years, with a proven track record of enabling product management success. Our training programs combine deep experience with hands-on practice to prepare product managers to achieve the independent and unique Certified Product Manager credential from the Association of International Product Marketing and Management (AIPMM). Our products and services include product management and product marketing consulting, contractors, training, certifications, recruiting, templates, coaching, books and a Product Management Optimization Program.